TSS PRO 300 is a breakthrough formulation combining reactive silicone and acrylic complexes that form a high-performance breathable polymer that cures with a low sheen, rich wet look. It can be used on previously coated or uncoated interior or exterior surfaces such as pavers, concrete products, slate, Mexican tile, unglazed tiles, brick, aggregate, natural and artificial stone (flagstone, moss rock, cantera, travertine), masonry, stucco, and wood; can be used around pools, fountains, showers etc. TSS300 is a color enhancing, wet look, silicone and acrylic combination sealant that protects surfaces from salt water, pool chemicals, oils and vehicle fluids. It infiltrates deep into the surface, forming a barrier that will protect stone for years, while maintaining a wet-looking sheen. The TSS Pro-300 Low Sheen Wetlook Sealer is an incredibly unique sealer type offered through the TSS Pro Sealer line. This deep-penetrating sealer is solvent-based, breathable, and leaves the sealed stone with a rich, wet-look finish. The sealer is made from silicone and acrylic polymer, making it highly durable and long lasting. 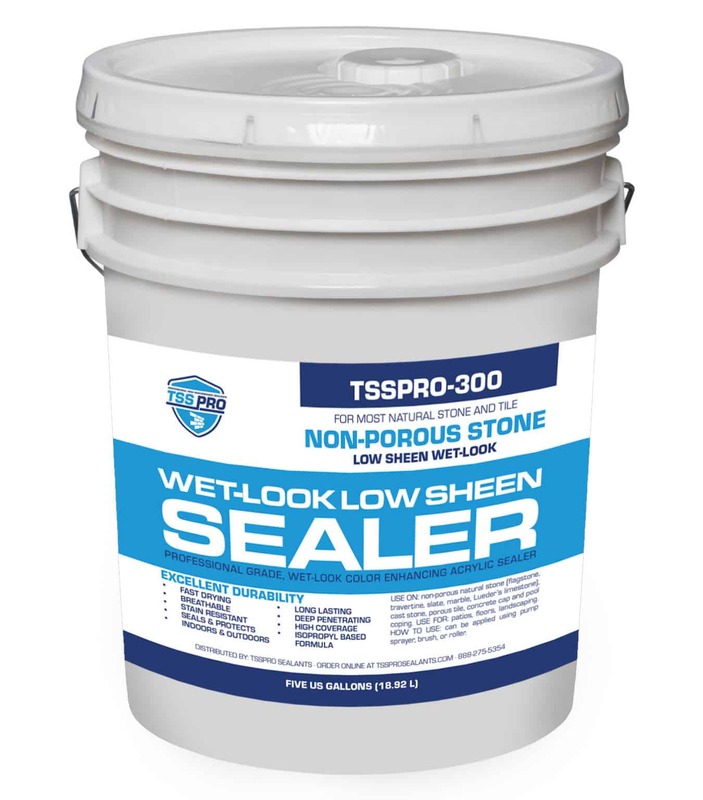 The TSS Pro-300 Low Sheen Wetlook Sealer is designed specifically for home, business, or property owners who want to choose a sealer that is going to provide ultimate longevity. The sealer gives long-term protection for a variety of surfaces, while also providing added beauty through its glossy wet look. The TSS Pro-300 Low Sheen Sealer is ideal for natural or man-made stone, pavers, masonry, brick, slate, tile, grout, concrete areas, and decorate landscaping. Even more so, the TSS Pro-300 Low Sheen Sealer is even more ideal for the surfaces above that are located near or are adjacent to swimming pools, or regular or saltwater ponds, as both ponds and pools expose stone to harsh chemicals and moisture, hastening the deterioration process. Stone patios surrounding pools are particularly susceptible to harsh chemicals in addition to the elements. Pool copings can also take a beating, and we can clean, repair, or replace your pool’s coping and mastic as well while we’re there. The only stone that TSS Pro-300 Low Sheen Wetlook Sealer is not recommended for Austin limestone but it’s recommended for Lueder’s limestone; the TSS Pro-200 High Performance Sealer is a better choice for Austin limestone. Finally, TSS Pro-300 like all our wet look products, should only be applied on a completely dry substrate. If stone has had water running over it the surface may be dry, but the interior will contain moisture – be sure it is completely dry before application. Too much moisture in a stone can cause the sealer to blush producing white areas. Also, be sure stone is completely dry after application before turning water back on. How is the TSS Pro-300 Low Sheen Wetlook Sealer applied? The TSS-Pro 300 Low Sheen Wetlook Sealer can be applied using a pump up spray, roller, or brush depending upon the surface to which it is being applied. What’s more, the sealer can be applied in multiple coats for an even glossier finish. And, the sealer cures and is ready for traffic within one hour of being applied, meaning that you won’t have to wait for days to enjoy your stone patio, countertop, pond, or other stone surface.